Posted on Fri, Jan 13, 2012 : 1:01 p.m.
LANSING — The Michigan Film Office announced today that the television series "Ariel, Zoey & Eli Too" has been approved for a film incentive from the state. The show, which stars three musically talented Ann Arbor siblings, is filmed primarily in Ann Arbor and Livonia. "'Ariel, Zoey & Eli Too' has seen tremendous growth in its first two seasons and is now reaching millions of households across the United States," said Carrie Jones, director of the Michigan Film Office, said in a press release. "With different guests from around Michigan, this show is a great way to showcase Michigan locations and talent to a large national audience." "Ariel, Zoey & Eli Too" was awarded an incentive of $191,646 on $456,300 of projected in-state expenditures, the state announced. The approval was made prior to Dec. 31 under the previous tax credit structure and is not part of the $25 million allocation for Fiscal Year 2012. The project is expected to hire four Michigan workers with a full-time equivalent of four jobs. 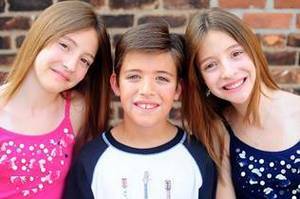 The nationally syndicated weekly children's show features Ariel and Zoey Engelbert, 13 -ear-old twins from Ann Arbor, and their 10-year-old brother, Eli. The siblings perform skits, musical numbers and interview special guests. The show is carried nationally on THECOOLTV nationally Monday-Friday at 4:30 p.m. An episode this week—scheduled to be rebroadcast Feb. 1—featured former Unviersity of Michigan football coach Lloyd Carr as a special guest. Locally, the show can be seen on Comcast 296, WOW 102, or digital channel 20.2 over the air from Detroit. Check out past coverage of "Ariel, Zoey & Eli Too." This brings 2011 numbers to 22 projects approved with $24,764,052 in incentives being awarded on $59,520,179 of approved production expenditures for the year. These projects are expected to create 1,952 Michigan hires with a full time equivalent of 400 jobs. The Michigan Economic Development Corporation (MEDC) Film Review Committee, consisting of senior MEDC staff including the Michigan Film Commissioner, reviews all completed applications. 1. The production is financially viable. 2. Utilization of existing infrastructure (studios, post-production facilities, film labs, etc.). 3. The number and wage levels of direct jobs for Michigan residents created by a production. 4. Ability to show Michigan in a positive light and promote the state as a tourist destination. 5. Magnitude of estimated expenditures in Michigan. Since the incentives took effect in April 2008, the Film Office and the Department of Treasury have approved a total of $385,829,866 in film incentives on $980,893,283 in total qualified expenditures by productions in Michigan. This represents 227 projects that have been approved to date, including 162 projects that have actually wrapped in the state. THIS is why you needed to raise my taxes? Sat, Jan 14, 2012 : 3:43 p.m. When are they going to stop using that old publicity photo, and those kids have been 10 and 13 for years. What gives? Sat, Jan 14, 2012 : 12:19 a.m.
&quot;This brings 2011 numbers to 22 projects approved with $24,764,052 in incentives being awarded on $59,520,179 of approved production expenditures for the year. These projects are expected to create 1,952 Michigan hires with a full time equivalent of 400 jobs.&quot; My math is rusty but on a very simplistic basis, we paid subsidies of $61,900 per FTE job to film makers in 2011. Of course the reality is that most of those jobs were part time and without benefits. Yes, there is uncalculable spin off economic activity from the presence of these film makers. One of the big problems is the &quot;spin off&quot; effect is largely uncalculable. In this writer's opinion, this film subsidy was poorly conceived and too expensive. I applaud Governor Snyder in his capping of the yearly subsidy. Sat, Jan 14, 2012 : 2:41 a.m. I don't know the percentage but much of that money went to Michigan vendors &amp;retailers that provided goods and services.So that would speak to why your math produced such a high number for each job created. Pretty lame picking on a ten year old boy, Steve! Grow up! And go Ariel, Zoey and Eli - we are proud of you!!! Fri, Jan 13, 2012 : 7:09 p.m.
Bless the little darlin's. Hope this doesn't turn into a Goslin thing.